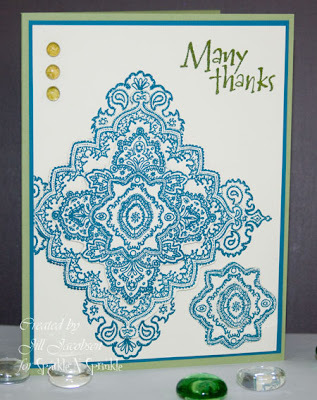 This week over at Sparkle N Sprinkle they are giving away the SVG file for this Lacy Medallion stamp. If you are interested in the free SVG file just email margaret@sparklensprinkle.com and let her know. The SVG has 5 layers, but instead of stacking them all I stamped the whole stamp on the mail layer and then 2 layers on top of that then put the top two layers off to the side. I actually had laid all the layers out in a pattern and it looked rather cool...will have to try that on a scrapbook page or something:) I also used the new Shades of Tuscany embossing powders (they will be revealed soon!) that are so totally awesome! I love the matte look and the fine detail of the powders. So loving that embossing powder - can't wait! Love your card Jill.